The workplace can quickly become a battlefield when employees breach previously unspoken boundaries and bosses respond with stone cold rule-setting. As a result, there is an increased need for soft skills in the workplace and for mutual understanding between employers and employees rather than overly restrictive formal parameters. Arbitrary rules ranging from the proportion of fluorescent coloring permitted in workers’ Nikes to the policing of beard length can foster disgruntlement in the workforce. Similarly, placing formal restrictions on how employees are allowed to decorate their workspace can make coming into work an unappealing prospect. Laying down the law creates a divide between boss and workforce that counters efforts to maximize the potential of teamwork. Mutual respect and open communication can be more productive than iron discipline when it comes to maintaining standards and boosting productivity in the workplace. Put simply, treating employees like cogs in the machine often results in reduced effort and creativity from the workforce. 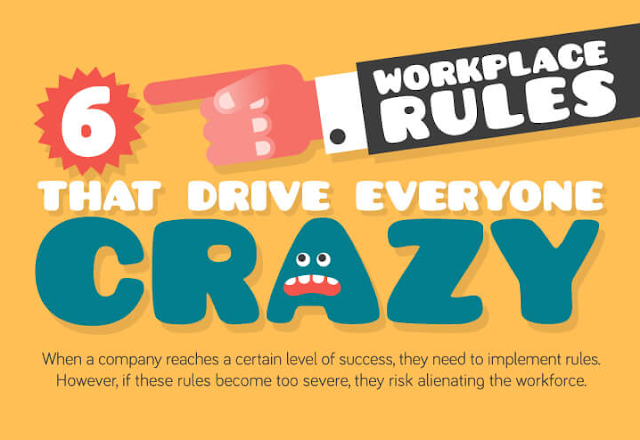 In this new infographic, you'll discover some of the potential areas of conflict in the work environment – and how a broad minded approach to them can be profitable for everyone involved.